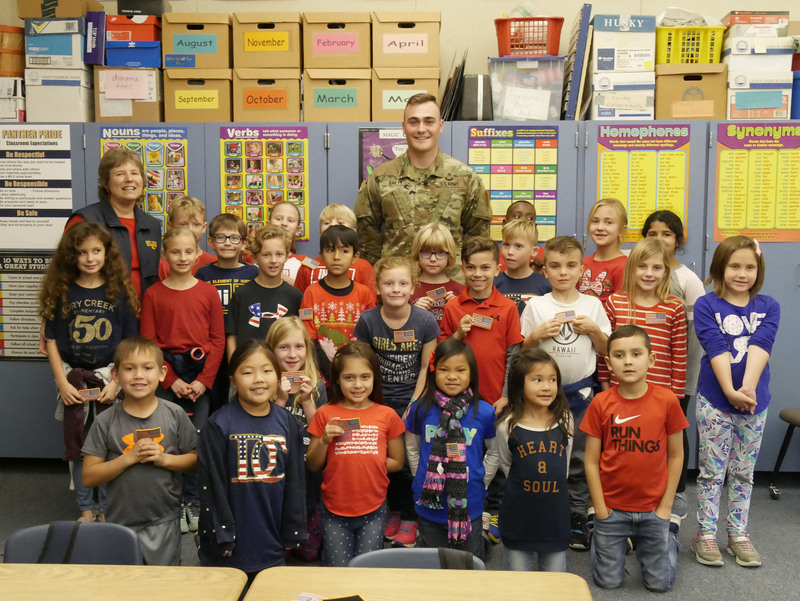 2nd Lt. Austin Bailey, a 2011 graduate of Buchanan High School, stopped by his former elementary school last Thursday to thank a group of students for their support. Bailey received the pair of hand-written letters last month as part of a care package from Central Valley Blue Star Moms that included non-perishable food items, toiletries and stationery. As it turned out, some of those letters were written by students at Dry Creek Elementary. Bailey, who is stationed in Georgia but returned home for Christmas, engaged in a Q&A session, recited the Pledge of Allegiance and sung The Army Song with students during his 30-minute visit. He also presenting the class with Army flag patches.